If you’re searching for a 2 week adventure holiday in Croatia, then look no further than this breath taking thrill & chill family trip. Our first 7 nights are spent in the Dalmatia hinterland, surrounded by rivers, canyons and biking trails, providing the thrills of nature. Dedicated to bringing teenagers of similar ages together, our Activity Base offers a social able environment for liked minded parents & teens. By day, we take on the power of nature and by night, we relax with great food. 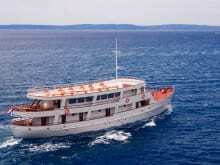 Our second week is spent on Croatia’s famous coastline, cruising the Adriatic Sea island hopping. Family sailing adventures in Croatia are the perfect way to see alot more of this stunning country, without the stress of car’s and ferries. Every day we travel to a new exciting destination, from Hvar to Dubrovnik the island highlights will be explored. Disembark and hang out with your shipmates, find your own secluded beaches, taste the beautiful local cuisine. If you want to engage your restless teenagers with something that will fire their imagination and give them some incredible memories, then join us this summer. This is much more than a family cruise around Croatia. Experience the natural beauty of this amazing country. 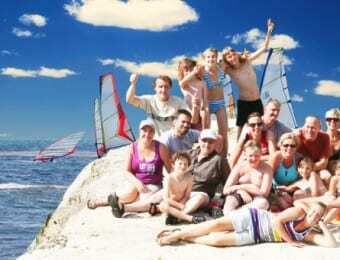 You’ll be starting our amazing Croatia family 2 week holiday from Split (airport or city centre). From Split, your family will be smoothly transferred to the lovely town of Trilj, in the heart of the Dalmatia countryside. 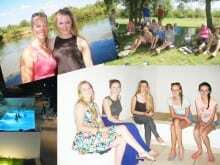 Consistently voted into the TOP TEN teenager activity holidays abroad, our adventure base has the perfect location. Close to our activity start points, nestled next to the Cetina River and surrounded by hiking & biking trails. All rooms are fitted with air-conditioning, satellite TV, and free wifi. The hotel has a games room and swimming pool. Unpack and start to relax. We set off onto the majestic Cetina River that flows alongside the hotel. This is the perfect activity to introduce your family to the pristine waters, paddling techniques and to the other families. Along the river we’ll be playing water games, and stopping for swim breaks. You start the morning with breakfast as usual, followed by a safety talk and discussing the cycle route ahead. Following this you will continue to bike through the quiet roads until you reach many astonishing viewpoints. The beautiful Croatian countryside, is the perfect place to cycle, whether a regular cyclist or not. Our biking guide will tell you of the historical and cultural significances of the surrounding areas and show you the hidden gems off the beaten track. We’ll stop at the local farm, trying their meats & cheeses, then continue to a stunning watermill and waterfall. If we get too hot, we’ll take a swim in the nearby river! 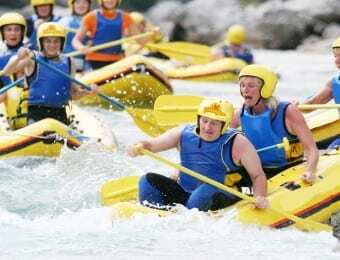 The wild Croatian rivers offer the perfect conditions for action packed white water challenges. Offering an array of thrilling dips, splash backs and hold tight moments. 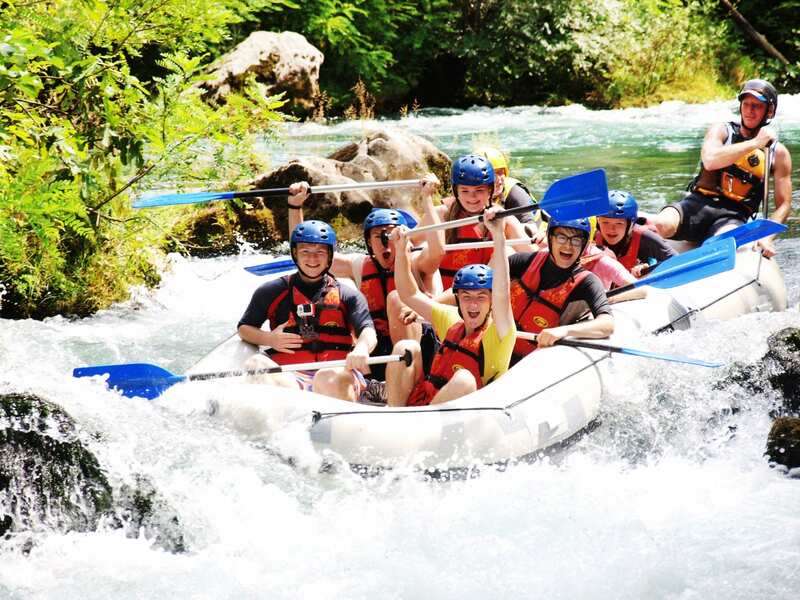 Parents needn’t panic, as our rafting captains are experts on these waters and will guide your family safely through the gushing waters and waterfalls. 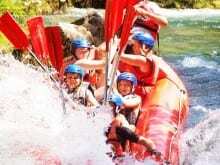 After the white water rafting, we’ll make our way to the coast for an afternoon of well deserved beach relaxation. Omis is a stunning pirate old town, with some of the best fish restaurants in the country. Shop or sun bathe, this is the place to relax. What is the right ingredients for the best 2 week adventure holiday ? We believe, its taking destiny in your own hands! In this spirit, you will be negotiating the rapid waters again, but without the aid of our captains. Voyage down the gorgeous gushing river rapids, in smaller hot dog shaped rafts, avoiding the rocks and splashing through white water drops. It’s incredible experience, and one you’ll never forget. Should you wish to do more, there are many possible ideas. From beach days to sightseeing in Split, we can help book them locally for you. For parents there is wine tasting at the local vine yard and for the ultra active, we can organise hiking and horse riding. 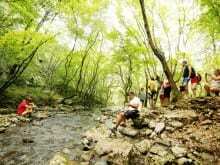 Surrounding our hotel are international biking trails and a pristine river adjacent to swim in. The hotel has WIFI, swimming pool and games room. Are you ready for an adventure tour of epic proportions? 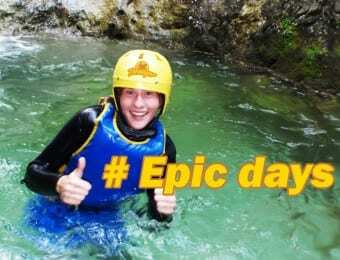 Then you must try canyoning in Croatia, perfect for family activity holidays. Trek deep down into the canyon for rock pool jumping, and some awesome splash action. Slide, jump, swim and shout like big kids. Find many stunning waterfalls, take some incredible 360 degree water pictures and get lost in this water wonder world. On Saturday, we depart for Split port to begin our second week of fun. Our sail motor boats are the perfect way to cruise the peaceful waters of the Adriatic, where guests can find plenty of private space to sit quietly with a book or to engage with other ship-mates. Today, we leave the Unesco town of Spit for the beautiful town of Makarska, settled at the foothill of the Biokov mountains. 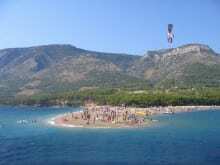 In Makarska you can enjoy relaxing on the long beaches or exploring the old town. Your teens certainly won’t be yearning for x-boxes or ipads, with views like this! Today we sail from Makarska to a very unique island with a National Park. Mljet is simply breath taking, and should not be missed in a Croatia sailing week for families. The island contains a sea locked lake, which at its deepest point is 29m deep. Within the lake is a small island, home to a Benedictine monastery which you can explore at your leisure. Bikes can be rented, which we highly recommend you do, and explore with your new friends. Cruising the coast is a unique way of seeing the highlights of Croatia’s island life. 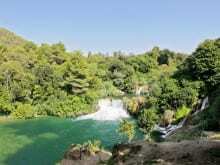 After the pristine nature of Mljet, we will sail to Dubrovnik, known as the pearl of the Adriatic. When you get there, you will see why. Hundreds of pretty red roofed houses are contained within the city rampart walls, and the small narrow streets contain a multitude of restaurant & shopping options. Dubrovnik adventures are not to be missed, and will be a true highlight to your stay with us. The morning is free to explore Dubrovnik in more depth, walk the city walls, ride the cable cart for panoramic views of the area or simply relax in one of the gorgeous town squares and soak up the atmosphere. 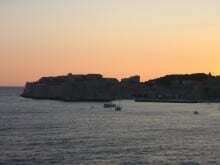 Around midday we leave Dubrovnik and head towards the island of Sipan. Of course it’s not a family active holiday without a refreshing swim, so we will make sure we have time for some fun and games. From Sipan we travel to Korcula, the birth place of Marco Polo. Between stops, we’ll be finding secluded bays for swimming and relaxation. Feel the magical atmosphere of this gorgeous town and island. In the evening you can explore the gorgeous tiny streets, chapels and churches; as well as enjoying the many fabulous restaurants. Of course the sea food is simply delicious here, some of the best in the country. As are the local white wines (parents take note!). Our two week adventure Croatia itinerary continues from romantic to hipster, as we head to Hvar town. There is a rich culture of entertainment in Hvar and there are many festivals throughout the summer. It’s the longest and most well known island, having been a holiday destination to some of Hollywood’s biggest A-List celebrities. So make sure the camera is at the ready, just in case you bump into Brad & Angelina and their tribe of children! For older teenagers or young spirited parents, we can recommend the night spot ‘Carpe-diem’, the open air dance floors and international DJs will have you dancing all night long. From Hvar we will be taking our sailing Croatia tour to the island of Brac, famous for the Zlatni Rat beach, which shape shifts throughout the tidal patterns of the day. From the island of Brac, we head towards Split, a town rich in Roman history. The must see attraction here is Diocletian’s Palace. Sadly its departure day, and we hope you have enjoyed your time with us. Without a doubt if you want adventures with sailing in Croatia, this is the extension trip to experience! It’s important to note – Airport transfer is not included on departure. 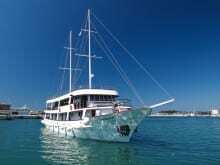 Taxis are reasdily available from Split port where you are moored. 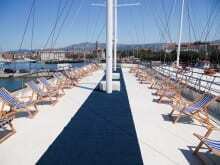 Week 2 – 7 x overnight stays [twin or double bed cabins] on our A+ Category sail-motor boats. Boats are moored side by side, often there can be 6 other boats pulled together. If you are the last boat, it will mean moving over the other boats. This is an obvious hazard for all guests, as between each boat (2 moving points), there is a gap of approximately 50cm. We discuss this in our welcome speeches to ensure everyone is aware of this hazard and if required our crew members will assist guests to cross if they are elderly or less mobile. Do call our staff with any questions. 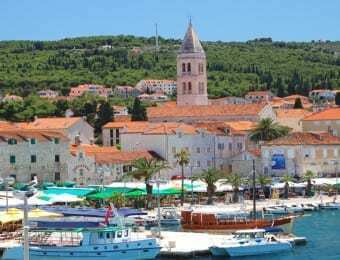 Every tourist in Croatia must register and pay a local tax at hotels, guest houses and on board ships. The captain collects passports at the start of the trip for registration and these are returned at the end of trip. If guests need passports through the week for any reason they are returned. Passports are normally returned on Friday or Saturday morning on settling drinks tabs before disembarkation. Trilj’s location has the perfect positioning for active breaks, being so close to canyons, rivers, countryside, cycling trails and blue flag beaches. 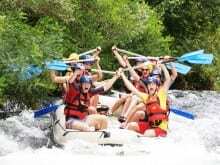 Teenager Activity Holidays consistently brings like minded families together, with dedicated teenage adventure weeks. Age and gender matching is what we do best, during your stay in Trilj. Our deluxe boats – offer the most luxury, in regards to room styling and quality. Do note: pictures are from a selection boats, styles will vary – and ship guests are not exclusive just to Teenager Activity Holidays customers. – Air conditioning (After midnight air-conditioning is subject to power restrictions in some ports). Active family sailing Croatia, is made so much more comfortable with our A+ plus category boats. 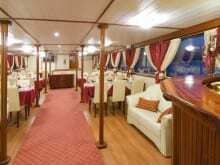 The ships take an average of 34 guests, with on-staff professional running all areas. These boats are perfect for family’s requiring more comfort, and wanting to see the very best highlights of the Adriatic Coastline. The blend is always a mixture of ages, but always a social able atmosphere. Do note: pictures are from a selection boats, styles will vary – and ship guests are not exclusive just to Teenager Activity Holidays customers. * Note after midnight air-conditioning is subject to power restrictions in some ports. I and two other families decided to escape to Croatia this summer and had the most incredible time with you this summer. It was originally Rachel from the Newins family that found your website, and I’m sure she’ll write a review if you need one from her, and we all agreed this seemed liked the perfect fitting for our similar aged teenage children. We found Teenager Activity Holidays to be very professional, and your guides gave us the impression of enjoying their jobs, which reflected very well on your company brand. Our guide in Trilj was Nina and she was a real sweetie, who went the extra mile to make our experiences so much better. When I got tired on the cycling, she really motivated me and I glad I didn’t give up and use the support van. Nina was always chatting amongst the kids, playing games and sharing great stories. She’s from the area, so its nice to know you are employing the local community to run your trips. The boys thought Neven was a ‘diamond geezer’, a friendly giant that was so warm and friendly. He did a lot of the transportation but also guided us on the canoe safari. Big highlights were canyoning and swimming underneath waterfalls. We really felt that we had been taken off the beaten track, and shown something unique and magical. 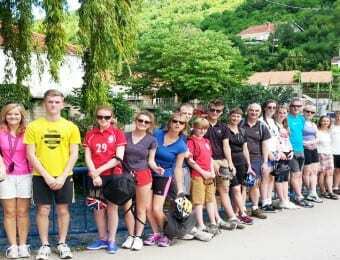 The hotel in Trilj was family run and food was excellent, facilities and location 5 stars for a teen adventure. It’s a 3 star property so don’t expect luxury trimmings or wow factor rooms, but the staff are incredible. The second week on board the motor sailing boat, was a lovely contrast. Each day we arrived in a stunning new location. 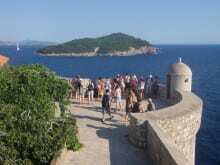 We discovered Korcula, Dubrovnik, Bol and some of the more looked over islands. The food on board was excellent, rooms en-suite with a/c. If you want to see much more of Croatia, but want to relax and disconnect, then this sailing trip was ideal. The teenagers loved the remote swimming places, having lilo surfing competitions and sleeping ondeck at night! The ships crew were enthusiastic and helpful, so please send our positive feedback to them. If you want blue water blue sky, then Croatia does seem like the perfect answer. I would highly recommend this active and sailing holiday. It offered the right blend of professionally organised sports and hospitality together to deliver many memorable days out. Our family would have no hesitation in recommending this 2 week adventure, and look forward to taking my family on many more adventures in the future. My family and I wanted to try an adventure holiday, but weren’t sure of the right destination. After a little ‘Googling’ we found your website and spoke to Richard. He was very responsive and within the working day, he had responded back with a custom made vacation, designed around the 2 week activity holiday in Croatia and its islands. The first week in Trilj was to be spent being more active and the opportunity to meet other like minded families (note – this ended up being our favourite week) and the second week, enjoying an island hopping sailing trip of Croatia’s best islands and old towns. Throughout the stay, we had lots of personal contact with staff and guides. Instructors we friendly and supportive but not pushy. The activity days in and around Trilj were challenging and great fun. We always felt that the durations were perfectly timed. This basically means, that the durations were enough to tire out my twin girls hahah and mum and dad could relax. There was plenty of things to do in our spare time, but most of the time we swam or sunbathed. The Croatian people are wonderful. We met many locals and tried many local dishes. Both mainland and islands seemed extremely safe, and we were very happy to let our teenagers go off and explore by themselves. Since returning home I have spent a lot of time, promoting these wonderful islands and your travel services. This was the perfect family activity holiday in Croatia, although not a cheap trip to book, it delivers wow factor experiences and quality. Hope that helps, anyone reading. A: The boats we operate with are owned and run privately. Our local operations team in Croatia ensures all boats and crew operate to a high standard. In the rare occurrence that there is a small problem, our local staff will react to your request immediately. A: This depends on the size of the sail boat, but the average boat size is around 25 people. En-suite boats accommodate on average 30 people, with the Premier ships taking an average of 38 people.